Ahson Saeed, of Corvallis reacts to a pile of burnt debris pulled from the local mosque in Corvallis, where an arsonist set a fire in the early hours of Nov. 28, 2010, in this Gazette-Times file photo. 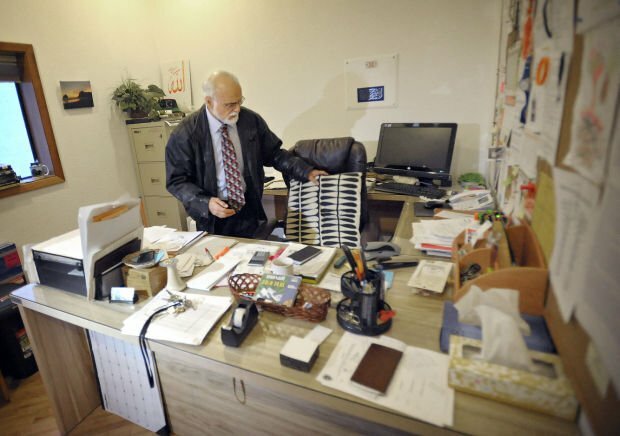 Mozafar Wanly, mosque elder at Salman Al-Farisi Mosque, works in the refurbished office that had been firebombed in 2010 in this December 2014 file photo. The inside of Director Mohammed Siala’s office where an arsonist threw a bottle of flammable liquid into the mosque in Corvallis on Nov. 28, 2010, in this file photo. Cody Crawford, pictured in this December 2010 file photo, is accused of firebombing a Corvallis mosque in 2010. 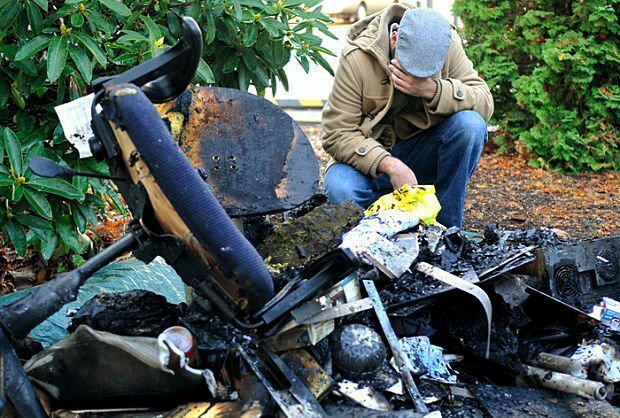 EUGENE — The 29-year-old man who pleaded no contest to starting the November 2010 arson at Corvallis’ Salman Al-Farisi mosque was sentenced Wednesday to five years probation. Cody Crawford, who was convicted of a federal charge of damaging religious property after pleading no contest in the case in November, received the probationary sentence as part of a plea agreement that was reportedly supported by the congregation of the Salman Al-Farisi mosque. Prosecutors didn’t recommend prison because Cody Crawford is mentally ill and mosque leaders expressed forgiveness and a desire to move on. U.S. District Court Judge Ann Aiken followed the plea agreement recommendations Wednesday. Crawford has been involuntarily hospitalized at Oregon State Hospital for the past 20 months after being found guilty except for insanity in a separate case. Crawford is scheduled to be released from Oregon State Hospital in June 2018 in that separate case. Once he is released, Crawford will be required to participate in a mental health treatment program. Crawford has been diagnosed with several mental illnesses, including bipolar disorder, depressive disorder and autism spectrum disorder. In a statement to the court Wednesday, Crawford described himself as a high functioning autistic. He also noted that he had never admitted to starting the fire and that he harbored no ill will toward Muslims. As part of the plea agreement for sentencing, federal prosecutor William Fitzgerald did not recommend prison for Crawford because of his mental illnesses. But Fitzgerald reminded the court Wednesday that Crawford was convicted and that there was sufficient evidence to prove that Crawford set fire to the mosque. During sentencing, Judge Aiken followed a plea agreement that was reportedly supported by the congregation of the Salman Al-Farisi mosque. Aiken said she would follow the plea agreement because she believed it more important that Crawford receive the care he needs, rather than punishment through incarceration. The fire at the Corvallis mosque happened after someone reportedly broke out a mosque window and threw in a two-liter soda bottle of flammable liquid, according to investigators. The fire extensively damaged an office at the mosque, which was repaired as a community effort. Investigators reportedly recovered a soda bottle, cap and flashlight that initially tested positive for Crawford’s DNA, according to court documents. Prosecutors have maintained that Crawford started the 2010 fire shortly after hearing about a thwarted terror plot in Portland and recognized the suspect in the case, Mohamed Mohamud, as someone who worshiped at the Corvallis mosque. Mohamud, who had been an Oregon State University student, was convicted of trying to bomb Portland’s annual Christmas tree-lighting ceremony and is serving a 30-year prison term. Crawford’s sentencing stipulates that, in addition to attending mental health treatment upon his release, Crawford will be required to not use alcohol, not possess any weapons, and have no contact with any representatives of the Salman Al-Farisi mosque. Aiken said she believed him. “You’re going to be fine when you’re out,” she said.